Maya Otega, Wood-Ridge's No. 9 batter, hit a seventh inning home run to help the Blue Devils secure a 5-1 victory on the road in Rutherford on Saturday. RUTHERFORD – High school softball teams usually spend the first week or so of their seasons tinkering with the lineup and trying to get a rhythm heading into league play. Playing a squeaky clean game this early in the season is not necessarily the norm. However, when a team is an underdog on the road “playing clean” is necessary to pull off the win, and Wood-Ridge needed to be in midseason form if it was going to beat perennially tough Rutherford. The Blue Devils caught a few needed breaks along the way before making their own breaks in the seventh inning. No. 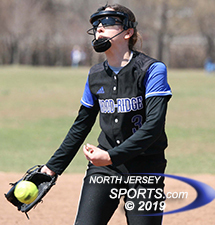 9 batter Maya Ortega hit a solo homer and winning pitcher Brooke Biamonte added a two-run shot later in the inning as Wood-Ridge opened some eyes in the NJIC a 5-1 triumph on Saturday afternoon at Memorial Field in Rutherford. Wood-Ridge got a confidence boost early when the first batter of the game reached on an error. Two batters later, Biamonte doubled to bring home Bella Iacovino. Samantha Perez then stroked a two-out, two-strike single that brought courtesy runner Victoria Nieves to make it 2-0. “Getting some runs in the first inning was fantastic for me and it gave me a lot of confidence just to hit my spots,” said Biamonte. Jordan Finelli scored the lone run for Rutherford. That was all the run support Biamonte needed in the circle. She ran into trouble in several innings, but the southpaw wiggled her way out of it by mixing speeds and trusting her defense to make the plays behind her. 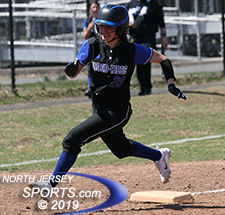 Rutherford got a run back in the bottom half of the first when Jordan Finelli singled and came around to score on an RBI groundout off the bat of Megan Tanella to cut the deficit to 2-1. The Bulldogs twice had a runner at third with one out but could not get the runner home on either occasion. 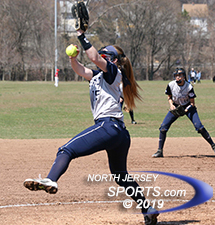 In the bottom of the third inning, Wood-Ridge third baseman Emma Baker made a juggling catch of a line drive to preserve the lead. Two innings later, Rutherford had the tying and go-ahead runners in scoring position when Biamonte buckled down to get out of the jam. Madylin Marino made a nice running catch in shallow right-center field to keep the potential tying run at third and Ortega snagged a pop-up at short to end the threat. Brooke Biamonte scattered seven hits and allowed just one unearned run for Wood-Ridge. She allowed just one walk, had five Ks, and had a three-RBI day at the plate. Although the Blue Devils held a one-run lead going into the seventh inning it was a tenuous one. They needed at least an insurance run to feel more comfortable and got it on one swing of the bat. Ortega went with a 2-2 fastball on the outer corner and crushed it to deep right for a solo homer and a 3-1 lead. Then with two outs Marino singled up the middle before Biamonte stepped in and hit a two-run bomb to put the game away. Biamonte scattered seven hits and allowed just one unearned run for Wood-Ridge (3-0). She allowed just one walk, had five K’s, and had a three-RBI day at the plate. Ortega was very productive out of the nine-hole going 3-3 with the big seventh-inning homerun. Finelli took the loss but did have 12 strikeouts along with a 2-4 day at the plate for Rutherford (1-2). Wood-Ridge came into this season with modest goals after finishing 11-12 in 2018. But with a strong start those goals have been adjusted and the Blue Devils are excited to see both how far they can continue this run and how they stack up against the upper echelon teams in the NJIC-Meadowlands Division, Hasbrouck Heights and Saddle Brook.